Which altered art 'celebrities' have you met? Some time ago we heard from one of our visitors that one of the most thrilling things that happened to her was to meet Swiss artist Vanci Stirnemann, who is credited with the creation of the first artist trading cards in 1996. Apparently he was in residence at the Cité Internationale des Arts in Paris, where our visitor also had a studio. She recalls that he was very nice, and that she felt like a silly, giggling teenager! 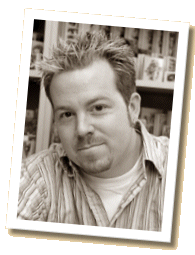 Although we've conducted an interview with Tim Holtz by email, we've never actually met him ourselves. We've read a lot of accounts, though, from people who have met Tim in person, and had a very similar reaction to that which our visitor records. This got us wondering which well-known names in altered art some of our other visitors had met, and what was the result of the meeting. Have you ever met anyone who's well-known in altered and mixed-media art? Did he or she inspire you to try something new, or were you so excited that you didn't take anything in? So which altered art 'celebrity' have you met? Was it an organised event, or did you meet by chance? What would you like to call your story, or whom did you meet? Entering your story is easy - just type! Your story will appear on the web page exactly the way you enter it here, although we may need to make minor editorial changes. If you wish to make a word appear bold, please type it between square brackets. For example, [bold] would appear as bold. The first few lines of your story will be displayed on this page beneath the title, so write something that will arouse the interest of other visitors. Although we welcome all contributions, we love detail. Don't be afraid to tell us everything that happened - there's plenty of room, and the more you tell us the more interested other visitors will be in what you have to say. We'd love to see a picture that you took of your altered art 'celebrity', or perhaps you had one taken together. If you have a photograph, just click the button to browse for it on your computer. Don't worry if you've already posted it on your blog. As we say in our submission guidelines referred to below, we don't mind if we don't have the exclusive! All that we ask is that you make sure that you're not infringing someone else's copyright by posting it here.